This tutorial covers the topics on Fiber Optics Gain Simulator which includes numpy for importing data from .txt files, matplotlib for graphs, scipy.fftpack for fft analysis and PyQt5 GUI packages. 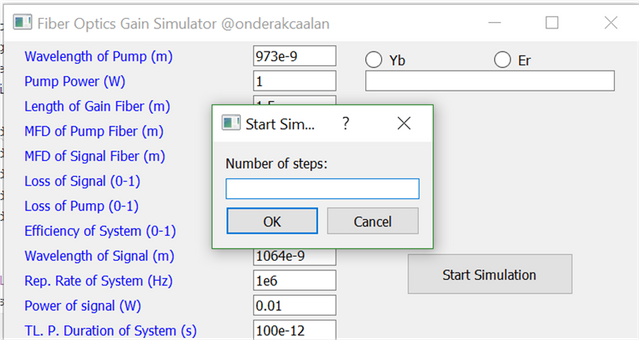 For this simulation there will be 3 or 4 tutorials. 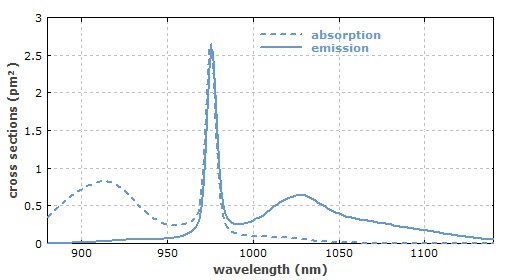 This is the first part of the simulation which includes Ytterbium and Erbium gain fibers' absorption and emission graphs and also creating some gaussian signal and its wavelength conversion. This tutorial will be interested in by @steemstem community due to some scientific calculations understanding the Fiber Optic Simulations. 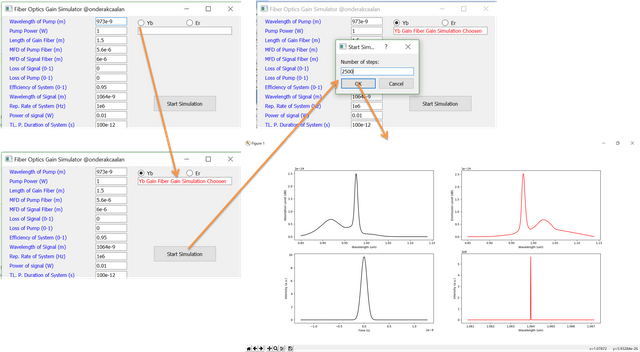 At the end of the tutorails, we will create a package about Fiber Optics Gain Simulator to make simulation how the input signal amplifies through the gain fibers. You will learn importing file from .txt files by using numpy package. You will learn creating some functions such as Gaussian and its fft analysis to get spectrum conversion by using scipy.fftpack package. You will learn how to use GUI window by using PyQt5 package. You will learn how to make a plots and also subplots by using matplotlib package. Write here a bullet list of the requirements for the user in order to follow this tutorial. PyCharm Community Edition 2017.3.4 x64. As you see that we defined some modules for some packages such as importing, plotting etc. This is for easy usage. Because when you want to call the package you do not need to remember the name of the package and also you can create some abbreviations not to write long names. Also if you want to call some subpackages you can use from ... import ... codes then you can get rid of writing full package and subpackage. You need to create a class to start the QWidgets subpackes inside the PyQt5 package. Then to continue program until you stop the program or quit the window, you need to add a function at the end of the program. We used init() constructor method to call inherited class which helps us not to write in each line to call our inherited class. Just we need to write self. it will be enough. Actually, you can change the name of variable self. but when we search websites they always suggest of usage of this as self..
Now we can write our program inside initUI functions. As you see we are using ** self** variable inside our functions because we do not want to call them from a spesific variables. This is for GUI data and these data will be always prepared inside the window. For each variables, we used QtWidgets.QLineEdit() method. Also you can move the line by using .move method and also define the boundaries of the label by using .resize method. If you want to give some initial variables you can set a text (it can be float, integer also string) and if you do not want to be changed this text by users you can define it as a read only by using .setReadOnly. Also we want to give some name for these lines to understand which line means. To do that we used QtWidgets.QLabel methods. We want to emphasize these labels by changing color by using .setStyleSheet method. If you want to use .setStyleSheet method effectively you can check this website. To work on self.Yb function we need to create a function. Then by using .self.sender() method we can keep a info about the button is clicked or not. Then by using if statement we can write some duties for this function. To check the situation we used .isChecked() method. For example, here, we want to write a line such as "Yb Gain Fiber Gain Simulation Choosen" by using .setText to use this sentence to call another function (we will explain later). Then we added some other duties also. Inside this function we wrote our Fiber Optic Gain Simulator program. 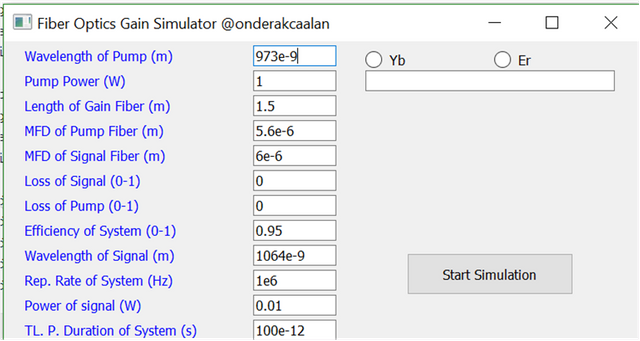 Here, we want to explain how to create the simulator and also plotting the data. This will be a little bit scientific also. If you do not want to read scientific parts you can skip that parts and read the methods parts. Before creating our input signal (scientifically not program signal:D) we define our variables such as center wavelength, pump power, transform limited pulse duration etc. Each of them is getting from the window part by using .text method such as: For numpy package you need to define your variables as float (float()) or integer (int()) because sometimes numpy package change the variables and you took some errors. Here, "tres" is "Total number of data points". As you see that, this method is used by .linspace(starting boundary, last boundary, # of data). Scientificly, we proportion to our time scale by gaussian scale which is (T / 1.665) where T is the trasnform limited pulse duration and 1.665 is a constant for gaussian scale. 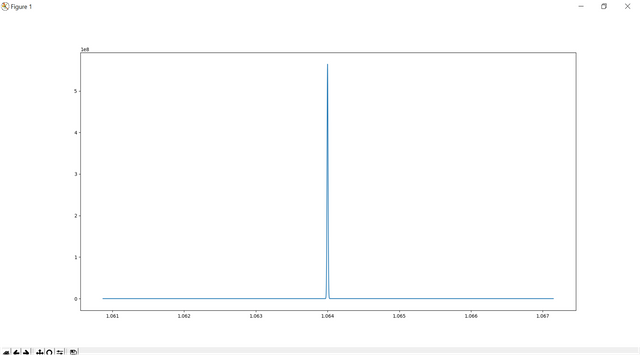 Also we divided the time sclae to "Number of data points corresponds to FWHM" to get exact value. First of we need to find our peak power of the pulse so we used pulse energy which can be found power/repetition rate of the system. Then by using peak power and time scale we can find electric field of the input signal. As you see that to use some mathematical expressions such as square root*, pi, exp, etc. we used numpy package. importing module is defined as importing numpy package which was eplained in the beginning of the tutorial. Here, we could not find any method to convert two numpy.array into one array. There are lots of suggestions such as .concatenate or .hstack. However nothing worked so we created our method and convert our two array data to one array by using for loops. If you know how to it please contact us. 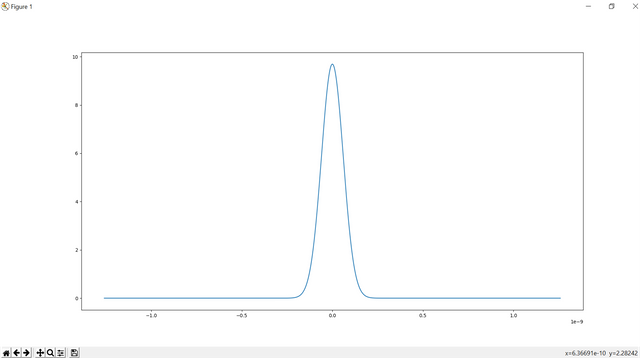 As you see that the pulse width is 100ps and the shape is gaussian. If you know how to make fft analysis, you will easily understanfd this part. your half of data will be same with the other half. So you need to divide your data after fft part which is made by fft() method and then combine them as one of half will be reverse. When we check linewidth we see that the linewidth is 0.015nm which is considerable with the transform limited pulse duration which is 100ps. As you see if you want to create a subplot you can use.subplot method by defining the row and column and the number of place. For example here, we created 2x2 subplot and we placed our subplots inside this plot. Up to now we learnt how to create E-field and spectrum conversio and also we learnt how to get data from a file which are emision and absorption spectrum data for Yb and Er gain fibers. For next tutorials we will try to create amplification part of the input signal for forward apmlification. Here is the list of related tutorials we have already shared on @utopian-io community. Hey @onderakcaalan! Thank you for the great work you've done!